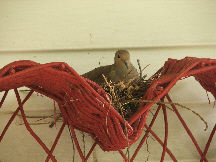 There is just something very sweet about a dove hanging out on the porch above a heart. Yep! That'd make a lovely Christmas or any-occasion card. Songbirds are so delicate- even chubby doves! This photo would make a great Christmas or blank greeting card! Lenise has a great idea. Take as many photographs as you can, watch her as closely as you can, then paint her for a blank card. Hold it if you want to. It will be a seller.